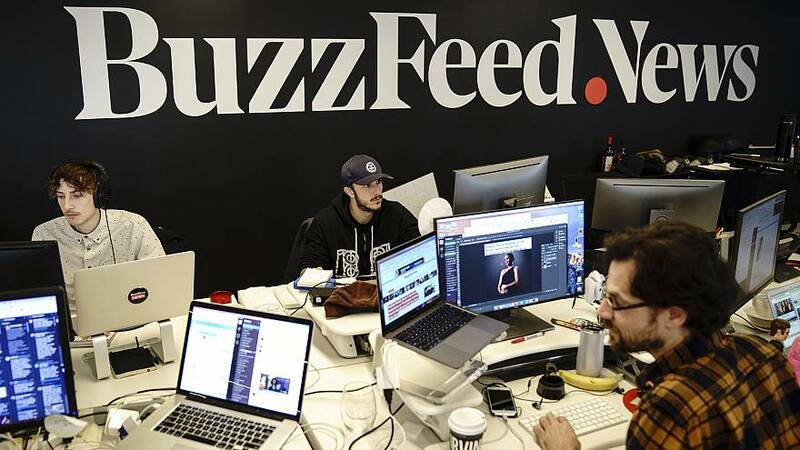 BuzzFeed, a website that runs serious investigative journalism alongside personality quizzes and fast-paced cooking videos, said it would lay off 15 percent of its staff, or around 200 people. The news was shared in a memo with staff in the early evening Wednesday. The news completes a trying day for staff at media companies. Verizon Media Group which owns outlets such as Yahoo News and HuffPost confirmed it was letting go of up to 800 people while Gannett, which owns USA Today and a host of local newspapers, also let go of staff on Wednesday. Separately, Condé Nast said it would put up a paywall around all of its titles by the end of the year to make-up for lost print advertising. BuzzFeed said its layoffs were part of an effort to shift the company's business model toward profitability. "Revenue growth by itself isn't enough to be successful in the long run," said co-founder and chief executive Jonah Peretti in the memo. Peretti said the business grew by double digits, with The New York Times reporting that the company's revenue was $300 million in 2018. BuzzFeed was once known as an internet pioneer that found new ways to work with marketers by creating content known as "native advertising," set alongside fun, shareable content aimed at young readers. It made BuzzFeed a trendsetting model for others. NBCUniversal (which owns NBC News) has a $400 million investment in BuzzFeed which is also backed by internet entrepreneur Kenneth Lerer. Back in 2016, the site had a valuation of $1.7 billion. I'm writing with sad news: we are doing layoffs at BuzzFeed next week. We will be making a 15% overall reduction in headcount across the company. I'm sending this tonight because I wanted you to hear it from me directly instead of from the press. Over the past few months, we've done extensive work examining the trends in our business and the evolving economics of the digital platforms. We've developed a good understanding of where we can consolidate our teams, focus in on the content that is working, and achieve the right cost structure to support our multi-revenue model. We are confident the changes we are making will put us on a firm foundation and allow us to invest and grow sustainably for years to come. I'm so proud of what our team accomplished over the last year, including diversifying our revenue, and growing our business double digits. Unfortunately, revenue growth by itself isn't enough to be successful in the long run. The restructuring we are undertaking will reduce our costs and improve our operating model so we can thrive and control our own destiny, without ever needing to raise funding again. These changes will allow us to be the clear winner in the market as the economics of digital media continue to improve. I'll share more about our future structure in a few days, but today I want to focus on what will be a difficult week, especially for the people who are leaving the company. These are talented people, friends, and valued colleagues, who've made huge contributions to our success, and who've done nothing wrong. Even though I'm confident this is the right business decision, it is upsetting and disappointing. On a personal note, I've never thought about my job as "just business." I care about the people at BuzzFeed more than anything other than my family. This will be a tough week for all of us and I realize it will be much worse for the people losing their jobs. To them, I want to say thank you, I'm sorry our work together is ending this way, and I hope we get to work together again in the future. Our loss will be to the benefit of other organizations where I know you will go on to make formidable contributions. We will be back to you with specifics on the process by Monday at the latest. Thank you all in advance for your compassion and kindness as we go through this process.